Its our extreme pleasure to have you here joining us for an impartation in the Word of God. experience, in God, through fellowship in practical bible based teaching and everyday living. Our goal is to be used by God to create an environment for you to gain a new vision for your life, to connect with other people, and get involved to experience the life you desire and deserve. Pastor Rashaan Boyd began his ministry in 1991 as youth pastor, youth department director and pastoral executive administrator in churches in Cincinnati, Ohio. In 2001 he was married to his wife Marcia. Rashaan and his lovely wife Marcia, were impressed of the Lord to begin a work in ministry in Cincinnati in March of 2011. They began hosting a weekly Bible study and fellowship known as Life in God Ministries. In March of 2012, Grace Christian Church was launched and is continuing to grow. God has gifted Pastor Rashaan with the ability to apply Biblical principles in a way thats relevant and practical; easily understood by people of all ages and backgrounds of life. 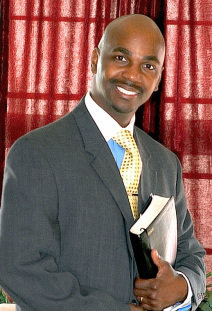 He is known for : getting right down to business" in his approach to delivering the Word of God. The challenging messages are always underscored with the grace and love of God. Both he and Marcia have a genuine love for God's word and his people. They strive to live Christ-filled passionate lives and yearn to see lives transformed by the power of the gospel of Jesus Christ. Marcia is a gifted executer of sound financial and technology principles. She is also passionate about the needs of women and teaches and promotes studies in this area of ministry. Together, Pastor Rashaan and Marcia have two children a son and a daughter that keep them extremely busy. A strong christian family is the core of their lives.